Other Names: Battle of Washington; Battle of Washington City; Battle of Washington, D.C.
Summary: On July 11, 1864, Lt. Gen. Jubal A. Early’s exhausted Confederates reached the outskirts of Washington near Silver Spring. (Early's Route to Washington.) Skirmishers advanced to test the fortifications which at the time were manned only by Home Guards, clerks, and convalescent troops. During the night, veteran units from the Union VI Corps disembarked from troop transports and marched north through the streets of Washington to bolster the defenses. 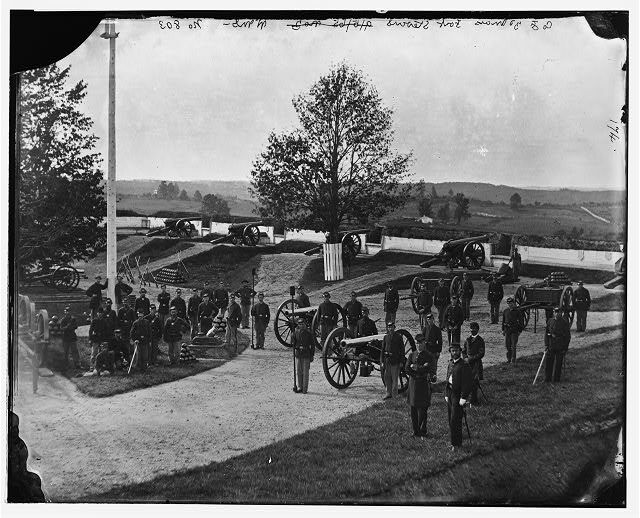 (Right) Soldiers of Company F, 3rd Massachusetts Heavy Artillery, in Fort Stevens. While this fort would come under enemy fire during the American Civil War, there was a total of sixty-eight fortresses that formed a strong, defensive ring around Washington in 1864. Library of Congress. On July 12, Early was finally in position to make a strong demonstration, which was repulsed by the veteran Union troops. In the afternoon, VI Corps units advanced against the Confederate skirmishers, driving them back from their advanced positions in front of Fort Stevens and DeRussy. President Lincoln watched the action from Fort Stevens and came under fire from Confederate sharpshooters. Recognizing that the Union Capitol was now defended by veterans, Early abandoned any thought of taking the city. 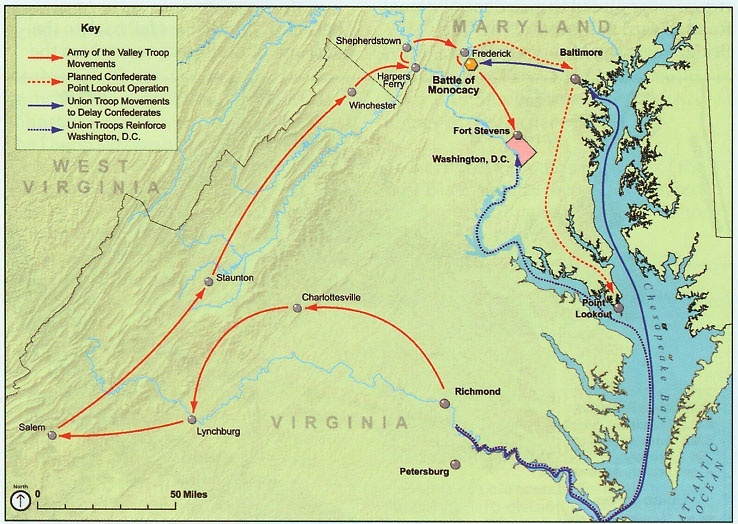 Early withdrew during the night, marching toward White’s Ford on the Potomac, ending his invasion of Maryland. “We didn’t take Washington,” Early told his staff officers, “but we scared Abe Lincoln like Hell!” Union casualties were 374 while Confederate losses were estimated at 500. (See also Maryland Civil War History). Setting the Stage: Robert E. Lee was concerned about Hunter's advances in the Valley during 1864, which threatened critical railroad lines and provisions for the Virginia-based Confederate forces. He sent Jubal Early's corps to sweep Union forces from the Valley and, if possible, to menace Washington, D.C., hoping to compel Grant to dilute his forces against Lee around Petersburg, Virginia. Early was operating in the shadow of Thomas J. "Stonewall" Jackson, whose 1862 Valley Campaign against superior forces was etched in Confederate history. (Stonewall Jackson's Valley Campaign: A History with Maps and Stonewall Jackson's Valley Campaign of 1862, by Confederate Military History). Early had a good start. He proceeded down the Valley without opposition, bypassed Harpers Ferry, crossed the Potomac River, and advanced into Maryland. Grant dispatched a corps under Horatio G. Wright and other troops under George Crook to reinforce Washington and pursue Early. 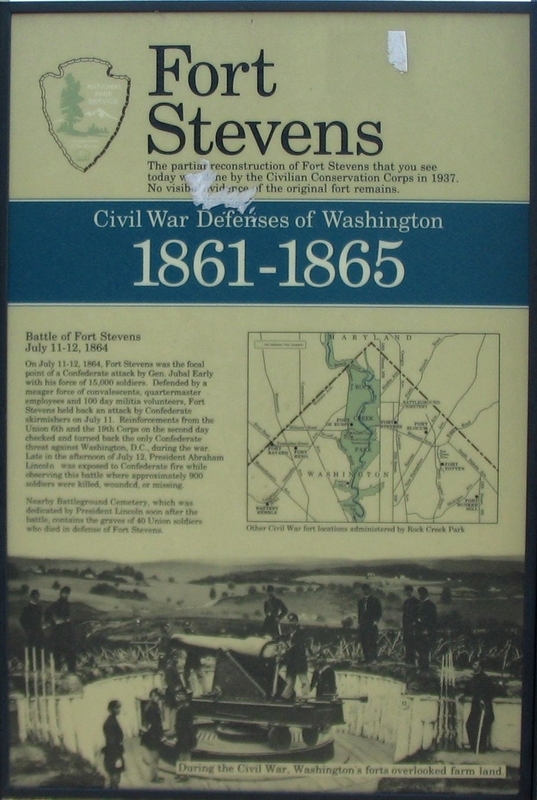 The Battle of Fort Stevens, also known as the Battle of Washington City or Battle of Washington, D.C., was one of several battles fought during Early's Raid and Operations against the B&O Railroad (June-August 1864). 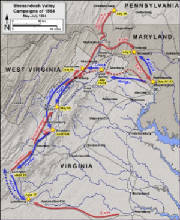 Early's Operations against the B&O Railroad, often times referred to as Early's Raid or Early's Maryland Campaign, was part of the Shenandoah Valley Campaigns of 1864 and was the second of three principal campaigns fought throughout the valley region. Early's Raid and Operations Against the B&O Railroad [June-August 1864], aka Early's Maryland Campaign, consisted of the following battles: Monocacy – Fort Stevens – Heaton's Crossroads – Cool Spring – Rutherford's Farm – Kernstown II – Folck's Mill – Moorefield. Early's invasion of Maryland had the desired effect on Grant, who dispatched the rest of the VI Corps and XIX Corps under Maj. Gen. Horatio G. Wright to Washington on July 9. The steamer carrying the Union force arrived in southeast Washington around noon on the July 11, at about the same time that Early himself had reached the outskirts of Fort Stevens with the lead elements of his troops. The arrival of the VI Corps brought desperately needed veteran reinforcements. It also added another high-ranking officer into a jumbled Federal command. The Washington defenses played host to a number of generals ejected from major theaters of the war or incapacitated for field command due to wounds or disease. Maj. Gen. Alexander M. McCook was one of the former, having not held a command since being relieved of command after the Battle of Chickamauga. McCook was, however, placed in command of the Defenses of the Potomac River & Washington, superseding Christopher Columbus Augur, who commanded the Department of Washington. Augur also commanded the XXII Corps, whose troops manned the capital's defensive works. Maj. Gen. Henry W. Halleck called upon Maj. Gen. Quincy A. Gillmore in New York City to take command of a detachment from the XIX Corps. The U.S. Army's Quartermaster General, Brig. Gen. Montgomery C. Meigs, took command of an "Emergency Division", composed of federal employees who were armed during the raid, directly under the command of McCook. Even President Abraham Lincoln personally arrived at the battlefield. McCook tried to sort out the problem of too many high-ranking generals in the face of Early's advance. He was unable to rid himself of the generals, and their attempts to gain leverage over one another, but a somewhat workable command structure was established. With McCook in overall command, Gillmore commanded the northeast line of fortresses (Fort Lincoln to Fort Totten), Meigs commanded the northern line of forts (Fort Totten to Fort DeRussy—including Fort Stevens) and Augur's First Division commander, Martin D. Hardin, commanded the northwest line of forts (Fort DeRussy to Fort Sumner). Wright and the VI Corps were initially to be held in reserve but McCook immediately decided against this, stating that he felt veteran troops needed to take the front lines against Early's troops. As it was, Hardin's troops engaged in some light skirmishing, but as McCook intended, it was to be Wright's veterans who bore the brunt of the fighting. Battle: At about the time Wright's command was arriving in Washington, Early's corps, after its fight at Monocacy, began to arrive at the breastworks of Fort Stevens. Yet, Early delayed the attack because he was still unsure of the federal strength defending the fort, much of his army was still in transit to the front, and the troops he had were exhausted due to the excessive heat and the fact that they had been on the march since June 13. Additionally, many of the Confederate troops had looted the home of Montgomery Blair, the son of the founder of Silver Spring, Maryland. They found barrels of whiskey in the basement of the mansion, called Blair Mansion, and many troops were allegedly too drunk to get a good start in the morning. This allowed for further fortification by Union troops. President Lincoln, his wife Mary, and some officers rode out to observe the attack, either on July 11th or the 12th, and were briefly under enemy fire that wounded a Union surgeon standing next to Lincoln on the Fort Stevens parapet. Lincoln was brusquely ordered to take cover by an officer, possibly Horatio Wright, although other probably apocryphal stories claim that it was Oliver Wendell Holmes, Jr., Private John A. Bedient of the 150th Ohio Infantry, the fort commander, other privates of the Ohio National Guard, and Elizabeth Thomas. Additional Union reinforcements from the VI and XIX Corps arrived overnight and were placed in reserve behind the line. The skirmishing continued into July 12, when Early finally decided that Washington could not be taken without heavy losses which would be too severe to warrant the attempt. Union artillery from Fort Stevens attempted to clear out Confederate sharpshooters hidden in the buildings and fields in front of the fort; when the artillery fire failed to drive them off, the IV Corps brigade of Daniel Bidwell, supported by Oliver Edwards' brigade and two Veteran Reserve Corps regiments, attacked at about 5 p.m. The attack was successful, but at the cost of over 300 men. 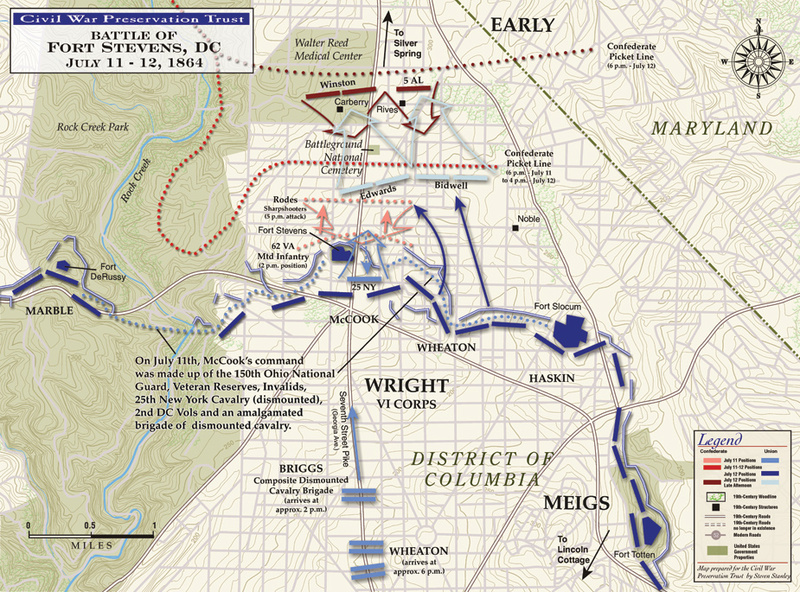 Analysis: The Battle of Fort Stevens was an American Civil War battle fought July 11–12, 1864, in Northwest Washington, D.C., as part of the Valley Campaigns of 1864 between forces under Confederate Lt. Gen. Jubal A. Early and Union Maj. Gen. Alexander McD. McCook. Although Early caused consternation in the Union government, reinforcements under Maj. Gen. Horatio G. Wright and the strong defenses of Fort Stevens minimized the military threat and Early withdrew after two days of skirmishing without attempting any serious assaults. The battle is noted for the personal presence of President Abraham Lincoln observing the fighting. In addition to their own commands these officers supervised a section of Washington's fortifications during the battle. Recommended Reading: Season of Fire: The Confederate Strike on Washington (Hardcover) (300 pages). Editorial Review from Booklist: In 1864, Confederate General Jubal Early, outraged by Union depredations in the Shenandoah Valley by the Federals, launched a bold but futile raid on the outskirts of Washington, D.C. With this event as the central focus of his narrative, Judge has written a fascinating and riveting account of the men in battle. He masterfully maintains both dramatic tension and historical accuracy by relating the events through the memoirs of the actual participants. Judge explains the military maneuvers in language that laypersons can easily grasp, and his portrayals of the key participants breathe life into the account. Continued below. Recommended Reading: Desperate Engagement: How a Little-Known Civil War Battle Saved Washington, D.C., and Changed American History. Description: The Battle of Monocacy, which took place on the blisteringly hot day of July 9, 1864, is one of the Civil War’s most significant yet little-known battles. What played out that day in the corn and wheat fields four miles south of Frederick, Maryland, was a full-field engagement between 12,000 battle-hardened Confederate troops led by the controversial Jubal Anderson Early, and 5,800 Union troops, many of them untested in battle, under the mercurial Lew Wallace, the future author of Ben-Hur. Continued below. Recommended Reading: Freedom Rising: Washington in the Civil War. Description: In this luminous portrait of wartime Washington, Ernest B. Furgurson–author of the widely acclaimed Chancellorsville 1863, Ashes of Glory, and Not War but Murder--brings to vivid life the personalities and events that animated the Capital during its most tumultuous time. Continued below. Recommended Reading: Reveille in Washington, 1860 - 1865. Description: Winner of the 1942 Pulitzer Prize in History, it is an authentic, scholarly description of life in Washington during the Civil War, written in a highly readable style. The "star" of the book is, indeed, the city of Washington D.C. Many players walk across the D.C. stage, and Leech's research paints vivid portraits not seen before about the Lincolns, Walt Whitman, Andrew Carnegie, Winfield Scott, John Wilkes Booth, and many others. It's the "Capitol" that you have never really seen or heard that much about. Continued below. It's a scrappy, dusty, muddy, unfinished city, begging for respect. Washington City, as it was called then, was both a respite for Union soldiers, as well as the Union Army’s “prostitution headquarters.” From the so-called 'highlife to the lowlife', the politician to the pauper, all receive their respectful, or rightful, place in this delightful but candid prose. Recommended Reading: The Shenandoah Valley Campaign of 1864 (Military Campaigns of the Civil War) (416 pages) (The University of North Carolina Press). Description: The 1864 Shenandoah Valley Campaign is generally regarded as one of the most important Civil War campaigns; it lasted more than four arduous months and claimed more than 25,000 casualties. The massive armies of Generals Philip H. Sheridan and Jubal A. Early had collided and contended for immense stakes... Beyond the agricultural bounty and the boost in morale to be gained with its numerous battles, events in the Valley would affect Abraham Lincoln's chances for reelection in November 1864. Continued below. Sources: National Park Service; Library of Congress; Official Records of the Union and Confederate Armies; Diary and Memoirs of Lt. Col. William Williams Stringfield; Civil War Preservation Trust; Bernstein, Steven. The Confederacy's Last Northern Offensive: Jubal Early, the Army of the Valley and the Raid on Washington. Jefferson, North Carolina: McFarland & Company, Inc., Publishers, 2011. ISBN 978-0-7864-5861-5; Cooling, Benjamin F. Jubal Early's Raid on Washington 1864. Baltimore, Maryland: The Nautical & Aviation Publishing Company of America, 1989. ISBN 0-933852-86-X; Kennedy, Frances H., ed., The Civil War Battlefield Guide, 2nd ed., Houghton Mifflin Co., 1998, ISBN 0-395-74012-6; Leepson, Marc. Desperate Engagement: How a Little-Known Civil War Battle Saved Washington D.C., and Changed American History. New York: Thomas Dunne Books (St. Martin's Press), 2005. ISBN 978-0-312-38223-0; Vandiver, Frank E. Jubal's Raid: General Early's Famous Attack on Washington in 1864. Lincoln: University of Nebraska Press, 1988. ISBN 978-0-8032-9610-7; Eicher, John H., & Eicher, David J., Civil War High Commands, Stanford University Press, 2001, ISBN 0-8047-3641-3. 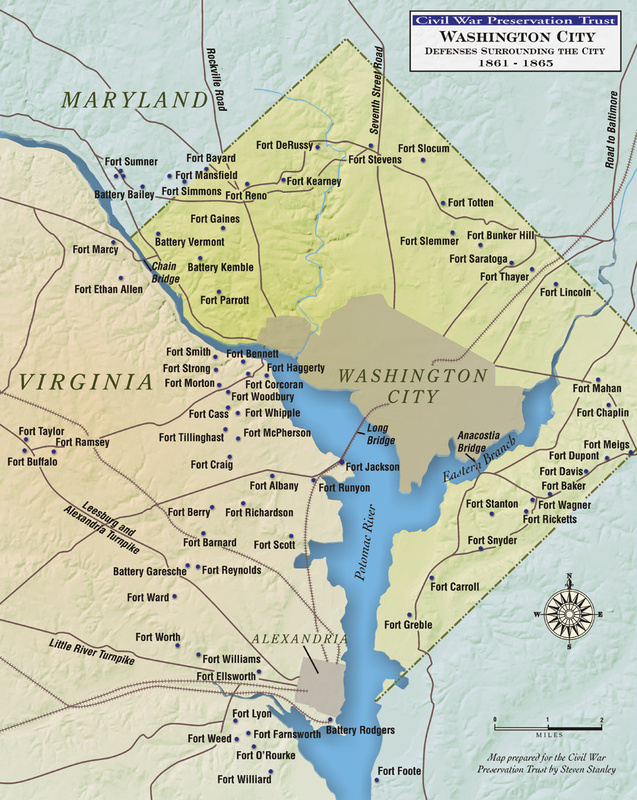 Try the Search Engine for Related Studies: Battle of Fort Stevens Washington DC Civil War History, General Early Shenandoah Valley Campaign Map and Maps, General Jubal Early’s Shenandoah Valley Campaigns, Raid and Operations against the B&O Railroad. The Forts and Defenses of Washington during the American Civil War and the Shenandoah Valley Operations, Photo, Photograph and Picture.